A KC-46A Pegasus tanker takes off from Boeing Field in Seattle last month. “With this milestone complete, the test program has demonstrated a level of maturity that positions Boeing to deliver, and the Air Force to accept, an aircraft by the end of October 2018,” Will Roper, the Air Force service acquisition executive, said in a statement. The recent tests involved the tanker’s remote vision system and refueling two more types of aircraft. Those results, combined with testing completed in June, made the tanker eligible for delivery, the Air Force said. McConnell is expected to receive 18 tankers between October and April 2019. The base will eventually be home to 36 tankers. McConnell spent $267 million on three hangars to house the tankers and several other projects, including a flight simulator and a fuselage trainer. The tanker is a military version of Boeing’s 767 commercial plane. It can carry passengers, cargo and patients, in addition to its refueling capabilities. 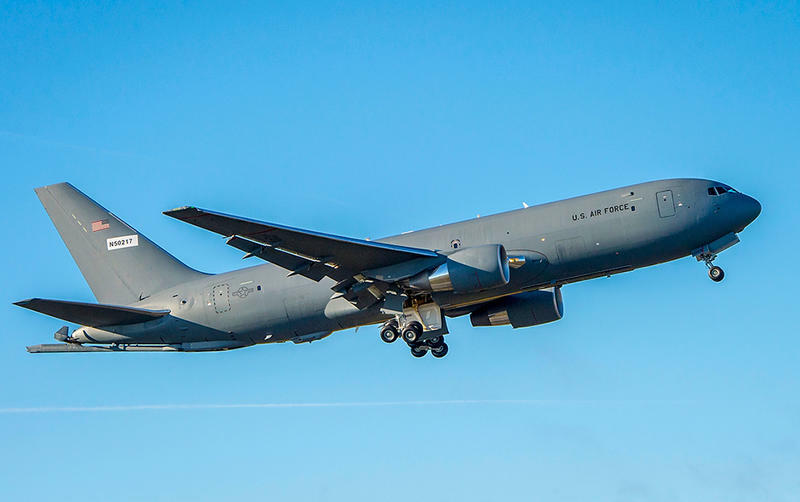 It will eventually replace the Air Force’s aging KC-135 Stratotanker fleet. Tom Shine is director of news and public affairs at KMUW. Follow his @thomaspshine.